These dive sites, abbreviated to TK1 and TK2, are named after a local village and are found on the Sulawesi side of the Strait. Topography consists of a dark sandy bottom with scattered rubble and sunken logs. 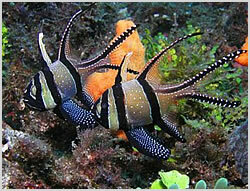 It is where the first mimic octopus was sighted in Lembeh, also the home of the Banggai Cardinalfish which can only be found in this region. No shortage of other marine inhabitants here either with mandarinfish, gobys, devilfish, frogfish, porcelain crabs and razorfish, this is an exceptional dive site.